Recently, at our annual Maryland Horseshoe Pitchers Assn. meeting, the issue of emergency preparation was discussed. The concern was expressed about our lack of procedures to deal with on-site emergencies. It was decided to append to each score keeping clipboard, a 4 line description of our exact location, including GPS coordinates, to assist the caller and 911 operator in defining our exact location. Secondly, we would request at any tournament, the identification of anyone having CPR training. It was also suggested that one or more officers receive CPR certification. The issue of AED (Automated External Defibrillator) availability was discussed. The cost in excess of $1K, precludes most small groups from purchasing one. However, a couple of options were presented. Summer time rental for 3 months. Or, contact with local fire departments about donation of unused or replaced AED’s to non-profit organizations. NOTE: The Trident, part of the Tribute series, is sanctioned for pitching in sanctioned tournaments by the NHPA. The foundry in Marcellus, Michigan is gearing up for production. I am hoping that the Trident will be available by the end of May. The weather in Maryland has been beautiful this Winter and Spring. It has given me and various testers the opportunity to test a variety of my prototypes. A request to design a shoe similar to the Ted Allen gave me an opportunity to work on a turn shoe. Most of my shoes have been designed for the flip pitcher. However, a change in the design of my hook calk allows any of those shoes to be flipped or turned from either side. So, I decided to put a bit more emphasis on shoes that could be flipped or turned by concentrating on the shank design. The result was the Aviator, Eagle, Trident and Coastie. Last week, two pitchers from my Legion Post 7 league wanted to test my prototypes. One was a 40 foot reverse flipper like my partner and the other was a 40 foot 1-1/4 turner. The flipper chose the Eagle and the turner chose the Trident. Both improved their ringer averages by 7%. Recently, I have been testing the Trident exclusively to determine if it was a candidate for NHPA licensing. It had already been approved by the NHPA based on conformance to their specifications. The only thing left was the $300 licensing fee. Last night, my partner, also a 40 foot reverse flipper was able to flip the Trident perfectly end over end after a dozen practice throws. So, my decision is made. It will be the Trident for the NHPA and Pro Tour tournaments this year, after I’ve sent the $300 of course. Whether to go into production or not is another issue. The description of the Trident is below. Click the image for a larger view. The design of the Trident considered the role of a double purpose horseshoe. 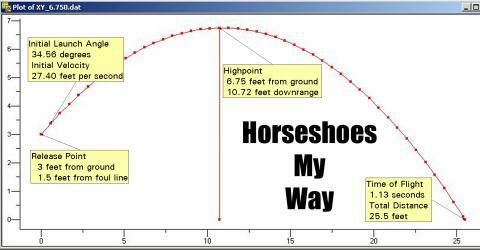 Most horseshoes are designed to target one method of throwing a horseshoe, either for turning or flipping. However, there is one aspect of horseshoe pitching that is often overlooked … the scoring of points. The facts are, a turner will frequently defeat a flipper of equal ringer average, relative to points. It’s simply a matter of the arrival of the shoe. 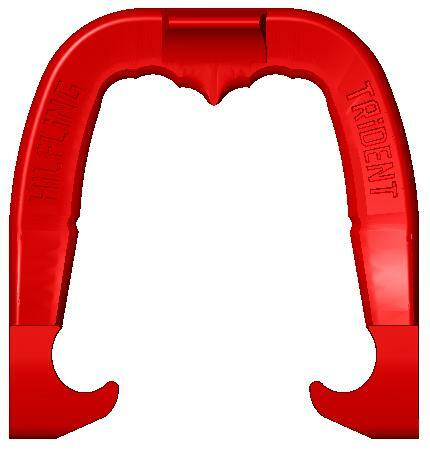 The Trident was designed to be considered a dual purpose horseshoe. For the TURNER, the shanks were designed to provide the correct shape and width for turning. A shank notch was provided to show the exact location of the center of gravity. The thumb calk was designed to be at the same height as the hook calks, thus providing for a three-point landing. For the FLIPPER, the ringer break was designed to deflect the shoe left or right, while not providing a location square to the line of flight. The shape of each side of the ringer break allowed the flipper the option of gripping the shoe for a slight rotation left or right when arriving at the stake. The location of the index and middle finger dictates which will occur. The thumb calk was designed to provide a firm, but, not tight grip pressure on the shoe. The width of the thumb calk was designed to allow the thumb to encourage a slight rotation if chosen. The overall shape of the shoe is more rectangular, thus, providing more opportunity to score points. I have always felt that a flipping shoe benefits from arriving over-flipped slightly. That is, the back of the shoe hits the ground before anything else. However, a rounded back end encourages a deflection left or right. Therefore, the back end of the Trident was designed to encourage a square forward thrust when it hits the ground. This feature is important whenever a shoe or shoes are already in front of the stake and allows the Trident to skip over the blocking shoe(s). A shoe that is under-flipped, that is, points down at arrival has little chance of moving forward. Finally, the shoe is perfectly balanced. The top and bottom of the shoe are equal at the center of gravity location. Further, the shoe is designed to be perimeter weighted. The outer edges are thicker than the inner. The hook calks are symmetrical, allowing the shoe to be flipped or turned from either side. The hook calk is blunted at the front end for safety purposes. Having said all of that, I may not go into production on this shoe. It is very expensive for an individual to produce horseshoes. It is also very difficult to find a foundry casting ductile iron or forging and willing to handle the production, not to mention the cleaning, painting, weight matching, boxing and shipping horseshoes. Finally, I don’t make any money from the sale of my horseshoes. All funds go directly to the foundry. Continue to Part 35 for a description of a technique called Square to Square.